By the end of 2018, EIA expects natural gas pipeline capacity into the South Central region of the US to reach almost 19 billion ft3/d. 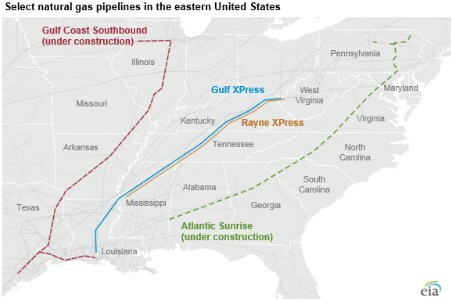 "Gas pipeline capacity to south central US to rise this year"
Of the additional 6.4 billion ft3/d of Northeast capacity planned to come online in 2018, more than 2.8 billion ft3/d reaches the South Central region directly through three projects that transport natural gas through the Midwest and Southeast: Rayne Xpress, Gulf Xpress, and Atlantic Sunrise. Further west, Natural Gas Pipeline of America’s Gulf Coast Southbound Phase 1 is scheduled to enter service in October 2018. This pipeline will transport up to 0.46 billion ft3/d of natural gas from Illinois into south Texas and Louisiana, where it will supply the Corpus Christi LNG export facility and pipelines into Mexico.